This Mother's Day blog entry is dedicated to my Mom. My mom has always been a great supporter of my photography (and everything else I've done in my life). 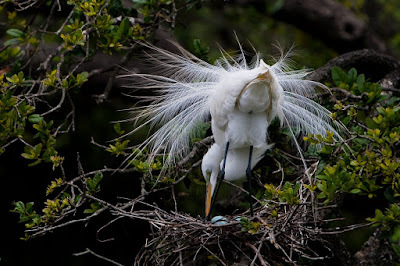 Much like this mother Great Egret tending to her eggs, my mom dedicated herself to motherhood with everything she had. And excuse the corny metaphor, but long after I "hatched" and even "fledged" she has been a constant support and confidant. Happy Mother's Day to all the amazing moms out there (especially my mom and my wife). You make the world a better place! I would like to point out on the blog as well as on Facebook that Eli, my brother, is a brown noser. It comes naturally to him. But we can forgive him this for the stunning beauty of his photos and his cheerful personality. Beautiful! I'll enjoy reading your blog. Wow, these pictures are breathtaking! My skills as a visionary allow me to see you as a professional photagrapher in the next year.